The story of how a young naturalist’s experiences on the Voyage of the Beagle fostered the greatest scientific theory ever discovered. Inverse Theater Company, which won Best Music/Lyrics in the 2003 NY Int’l Fringe for Lost – The Musical, and Artistic Director Kirk Wood Bromley, who won Best Playwright in the 2002 NY Int’l Fringe for The American Revolution, have joined forces with Tony Award winner Mark Hollmann (Best Score for UrineTown) and Obie Award winning actor (here in the title role) Steven Rattazzi (Obie Award winner for Painted Snake in a Painted Chair) to present this amazing production that tells the story and discusses the issues surrounding the greatest scientific journey of all time – The Voyage of the Beagle – in which Charles Darwin sailed around the world and discovered the theory of evolution. This theatrically thrilling and philosophically intriguing play is as ambitious as the journey it attempts to dramatize. The characters include an eager and sea-sick Charles Darwin, the strict and God-fearing Captain Fitzroy, historical figures John Henslow, Augustus Earle, Fanny Mostyn Owen and Emma Darwin, as well as gauchos (Spanish cowboys), Fuegians (native South Americans), restless sailors and the famed 13 Galapagos tortoises. Historical accounts of their ship life and travels, a chronological orientation of their journey and original excerpts from Darwin’s journals ground this piece in historical reality, while the storytelling both amuses and speculates as to the development of Darwin’s thoughts. At the center of this science-based play is Darwin’s personal struggle to identify the origin of species, and, by extension, the origin of humanity and all things human – morality, culture, and art. The full production will include songs, puppets, and aerial acrobatics. 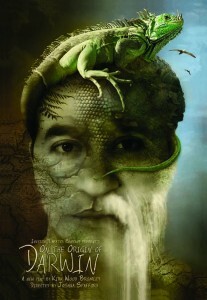 For anyone interested in Darwin, evolution, or science in general, this play will be a treat for the mind. For anyone eager to learn of these important subjects, this is an entertaining introduction. And for anyone simply interested in a great play, On the Origin of Darwin is a moving, humorous and fantastical night of theater.